Personally, I’m always satisfied when I see a horror game make good on the sales charts these days. After hearing certain big companies insist that gamers weren’t interested in scary games anymore, watching something like Five Nights At Freddy’s ($2.99) go big makes me feel good because it affirms that, hey, there are lots of different kinds of people with lots of different kinds of tastes buying and playing games. I wish I liked it more, but those are the breaks, sometimes. This game is one of those cases where, due to its fame, I heard a lot about it before I ever played it, but because it wasn’t in my direct line of sight, I only half-listened to everything. Going into the game, I knew it was supposed to be really frightening, and involved the nightmarish horrors more commonly known as animatronic mascots trying to kill you, but that’s about it. Well, it turns out there wasn’t a lot more to it than that, but let’s start with the premise. 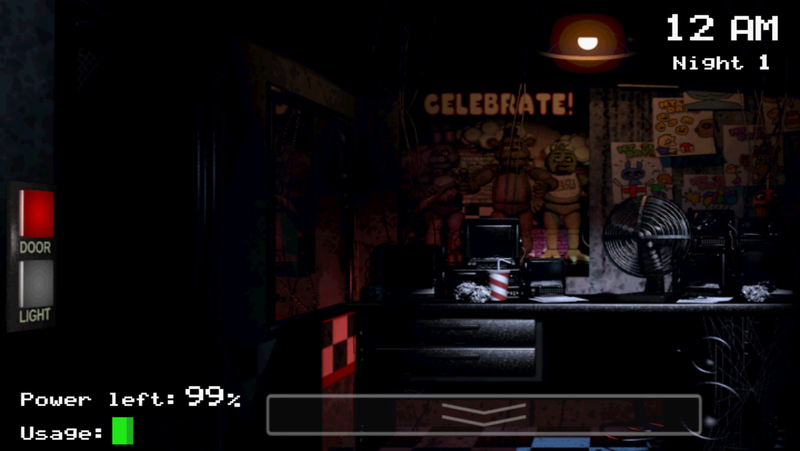 You play as Mike Schmidt, a newly-hired night security guard at Freddy Fazbear’s Pizza, a restaurant similar to Chuck E. Cheese and its variants. The restaurant has seen better days following a couple of incidents, and can’t afford to let you go all wild using electricity. Everything you do consumes some of your precious power budget for the night, and if you run out, it’s lights out. That doesn’t sound like such a big problem except for one little thing. The animatronic mascots that perform for the children during the day are a little bit off. They roam around at night so that their machinery doesn’t lock up or something, and if they happen to see you, they’ll assume you’re a robot out of costume and try to help you out. They’ll do that by cramming you into a Freddy Fazbear suit, but since they’re not meant for humans, the process will unfortunately result in your gruesome demise. While they’re free to roam around, you are not. You’re confined to the office, and can only pan across the scene, check the cameras, switch the hallway lights on either side on or off, and close or open the emergency doors to the hallways. These doors are your only protection from the robots, but if you use them too often, you’ll certainly run out of power by morning. The key, then, is to keep tabs on where each robot is at any given time using the cameras, and close the doors if they approach the office. This is all done by tapping on a few different buttons, so it’s straightforward to play. Each robot has their own particular routines and quirks, and each night, they’ll become more intelligent and aggressive. If you survive the week, you’ll collect a sweet paycheck and get laid off for your troubles. It’ll probably take you a little while before you get good enough to survive that week, though. 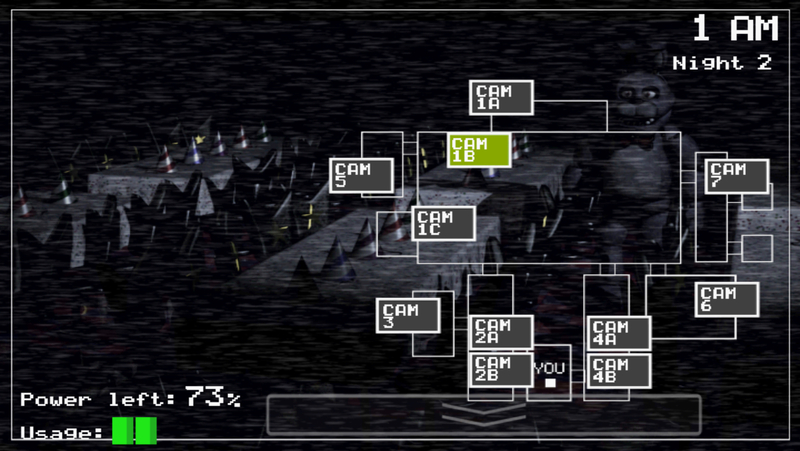 There’s actually quite a lot going on beyond the surface in Five Nights if you look for it. If you choose not to, it’s a very straightforward game that essentially pits you against your own paranoia and curiosity. That electricity percentage is basically measuring how much you can afford to indulge your irrational fears, and if you listen to your imagination too much, you will certainly lose. It’s enormously clever in its simplicity, almost like a magic trick played on your emotions. You’ll very rarely catch any of the robots moving, but in flicking between cameras, you’ll catch glimpses of them. More importantly, you can hear them, and without any background music or similar distractions, the sounds of their clanking around gets the main stage in the audio. At the start of each night, you’ll also get a phone call from the previous security guard, who helps establish the setting and gives you some important tips, like checking in on Foxy from time to time. We never do find out his name, but he’s pretty much your only lifeline in the whole mess. Going deeper, you can find all kinds of interesting details in the backgrounds if you look hard enough. You also might notice some things changing that have no reason to be changing. If you’re very lucky, you’ll even get a visit from a special mascot. There’s a lot more lore behind the setting than you ever need to notice, but if you search it out, you can start to piece together some disturbing things that help add to the atmosphere. If you really pay attention, you might even start to notice how certain robots only enter particular rooms or approach from certain sides, which will help you stay alive. The game is pretty hard, but it ramps its challenge up nicely. You’ll surely survive the first night, when only two of the robots are in play and not very aggressive. The second night makes them a little more agitated, but it’s not until the third night, where Freddy himself joins the wandering, that business truly picks up. 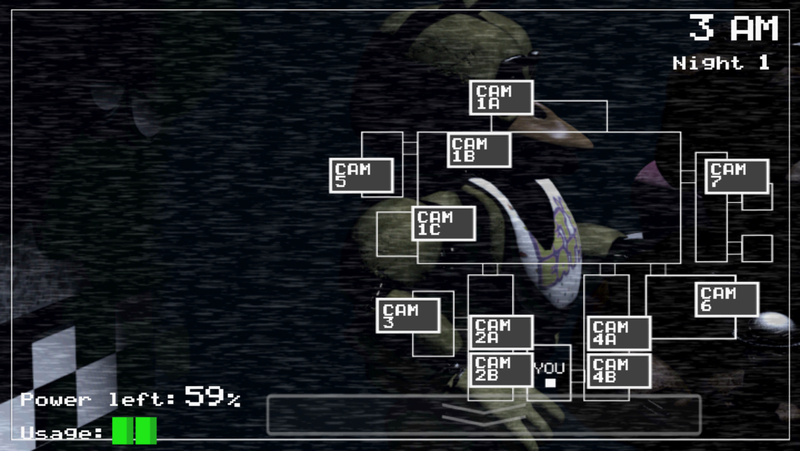 Once you complete the five nights, there are a still a few little surprises ahead of you, but nothing too big. If you’re steady enough to avoid getting rattled and pay attention to the patterns, you can get through the whole game pretty quickly. The AI doesn’t follow the exact same routines every time, but certain behaviors are fixed, so while you can replay the game and get something out of it, once you’ve worked out the rules and get past your fear and paranoia, most of the game becomes a bit of a snooze on repeat trips. That’s fine, since this game is more focused on delivering an emotional experience than being some kind of gameplay classic you pull off your shelf for years to come, but it’s important that you come into it aware of that if you want to enjoy yourself fully. Whether Five Nights At Freddy’s clicks for you or not is heavily reliant on how well it manages to shake you. If the atmosphere doesn’t get to you, all that’s left is a very simple game of red light-green light. If I’m to be honest, this is what happened to me. I wasn’t particularly scared or paranoid playing it, probably because I didn’t play it in very spooky conditions. By the time I did get around to trying it out in a dark place with the sound up nice and high, I had already seen most of its cards. Still, I can appreciate what’s going on with the design here, and I think as long as you approach the game with a mind to its intended atmosphere, it’ll likely produce the desired effect in you. If you’re just going to play it on the bus or something, you’re probably better off spending the weekend at Bernie’s instead.